Hildegard, renowned as a mystic, author, musical composer; a researcher in science, medicine and herbs, she presented a powerful woman to the people of her time. Born in Germany, 1098, the 10th child of a wealthy family, Hildegard experienced visions from an early age. At age 8 she was sent to a Benedictine monastery as a “tithe child” under care of Jutta. A dedicated student and nun, she was elected abbess in 1136. She separated what was a double house and moved the women to Rupertsburg, gaining freedom for her female leadership in 1148. Labor, part of Benedictine rule, included nursing and illuminating manuscripts at Rupertsburg. Joyous in the gifts of God’s created world she stated, “Creation looks on its Creator like the beloved looks on the lover.” She saw mankind standing like a cross, with outstretched arms, projected upwards to the cosmic circle. Expressed in her, Book of God’s Work, God spoke: “I…enkindle all sparks of life…With my wings I fly around the circle of earth, for I have properly put it in order by my wisdom. I, the flaming life of divine essence, glow above the beauty of the fields; I glisten in the waters; I burn in the sun, in the moon and the stars. And with the pleasant breeze – … I bring everything to powerful life. Air lives in the greens and the blooms. The waters flow as if they lived. I, the fiery power, remain hidden in all these things; they burn through me... For I am the life.” By the incarnation, God becoming man in the created world, the world is consecrated and this is central to her work. In this icon, Hildegard, describes a vision to her devoted servant and friend Richardis, who records her words. Above them is an image of the cosmos, similar to the above description. It is a detail of her art, “Redemption,” the Order of the Four Elements, illuminated in her book, Scivias. Above the words is the title of one of her music compositions, “O Holy Wisdom.” She felt music a way to recover the unity of body, mind and soul in our relationship with God. Her feast day is Sept. 17. Known for: Medieval mystic or prophet and visionary. Abbess. Composer of music. Writer of books on spirituality, visions, medicine, health and nutrition, nature. Correspondent with many ordinary and powerful people. Critic of secular and religious leaders. Born in Bemersheim (Böckelheim), West Franconia (now Germany), she was the tenth child of a well-to-do family. She'd had visions connected with illness (perhaps migraines) from a young age, and in 1106 her parents sent her to a 400-year-old Benedictine monastery which had only recently added a section for women. They put her under the care of a noblewoman and resident there, Jutta, calling Hildegard the family's "tithe" to God. Jutta, whom Hildegard later referred to as an "unlearned woman," taught Hildegard to read and to write. Jutta became the abbess of the convent, which attracted other young women of noble background. In that time, convents were often places of learning, a welcome home to women who had intellectual gifts. Hildegard, as was true of many other women in convents at the time, learned Latin, read the scriptures, and had access to many other books of religious and philosophical nature. Those who have traced the influence of ideas in her writings find that Hildegard must have read quite extensively. Part of the Benedictine rule required study, and Hildegard clearly availed herself of the opportunities. When Jutta died in 1136, Hildegard was elected unanimously as the new abbess. Rather than continue as part of a double house -- a monastery with units for men and for women -- Hildegard in 1148 decided to move the convent to Rupertsberg, where it was on its own, not directly under the supervision of a male house. This gave Hildegard considerable freedom as an administrator, and she traveled frequently in Germany and France. She claimed that she was following God's order in making the move, firmly opposing her abbot's opposition. Literally firmly: she assumed a rigid position, lying like a rock, until he gave his permission for the move. The move was completed in 1150. The Rupertsberg convent grew to as many as 50 women, and became a popular burial site for the wealthy of the area. The women who joined the convent were of wealthy backgrounds, and the convent did not discourage them from maintaining something of their lifestyle. Hildegard of Bingen withstood criticism of this practice, claiming that wearing jewelry to worship God was honoring God, not practicing selfishness. Part of the Benedictine rule is labor, and Hildegard spent early years in nursing, and at Rupertsberg in illustrating ("illuminating") manuscripts. She hid her early visions; only after she was elected abbess did she receive a vision which she said clarified her knowledge of "the psaltery..., the evangelists and the volumes of the Old and New Testament." Still showing much self-doubt, she began to write and to share her visions. Hildegard of Bingen lived at a time when, within the Benedictine movement, there was stress on the inner experience, personal meditation, an immediate relationship with God, and visions. It was also a time in Germany of striving between papal authority and the authority of the German (Holy Roman) emperor, and by a papal schism. Richardis or Ricardis von Stade, one of the convent's nuns who was a personal assistant to Hildegard of Bingen, was a special favorite of Hildegard. Richardis' brother was an archbishop, and he arranged for his sister to head another convent. Hildegard tried to persuade Richardis to stay, and wrote insulting letters to the brother and even wrote to the Pope hoping to stop the move. But Richardis left, and died after she decided to return to Rupertsberg. A final famous incident happened near the end of Hildegard's life, when she was in her eighties. She allowed a nobleman who had been excommunicated to be buried at the convent, seeing that he had last rites. She claimed she'd received word from God allowing the burial. But her ecclesiastical superiors intervened, and ordered the body exhumed. Hildegard defied the authorities by hiding the grave, and the authorities excommunicated the entire convent community. Most insultingly to Hildegard, the interdict prohibited the community from singing. She complied with the interdict, avoiding singing and communion, but did not comply with the command to exhume the corpse. Hildegard appealed the decision to yet higher church authorities, and finally had the interdict lifted. The best-known writing of Hildegard of Bingen is a trilogy (1141–52) including Scivias, Liber Vitae Meritorum, (Book of the Life of Merits), and Liber Divinorum Operum (Book of the Divine Works). These include records of her visions -- many are apocalyptic -- and her explanations of scripture and salvation history. She also wrote plays, poetry, and music, and many of her hymns and song cycles are recorded today. She even wrote on medicine and nature -- and it's important to note that for Hildegard of Bingen, as for many in medieval times, theology, medicine, music, and similar topics were unitary, not separate spheres of knowledge. Hildegard of Bingen - Feminist? Today, Hildegard of Bingen is celebrated as a feminist; this has to be interpreted within the context of her times. On the one hand, she accepted many of the assumptions of the time about the inferiority of women. She called herself a "paupercula feminea forma" or poor weak woman, and implied that the current "feminine" age was thereby a less-desireable age. That God depended on women to bring his message was a sign of the chaotic times, not a sign of the advance of women. On the other hand, in practice, she exercised considerably more authority than most women of her time, and she celebrated feminine community and beauty in her spiritual writings. She used the metaphor of marriage to God, though this was not her invention nor a new metaphor -- but it was not universal. Her visions have female figures in them: Ecclesia, Caritas (heavenly love), Sapientia, and others. In her texts on medicine, she included topics which male writers usually did not, such as how to deal with menstrual cramps. She also wrote a text just on what we'd today call gynecology. Clearly, she was a more prolific writer than most women of her era; more to the point, she was more prolific than most of the men of the time. There were some suspicions that her writing was not her own, and could be attributed to her scribe, Volman, who seems to have taken the writings that she put down and made permanent records of them. But even in her writing after he died, her usual fluency and complexity of writing is present. Hildegard of Bingen - Saint? 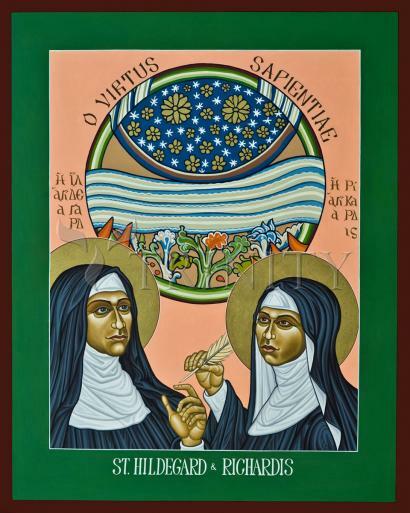 Perhaps because of her famous (or infamous) flouting of ecclesiastical authority, Hildegard of Bingen was not canonized by the Roman Catholic Church as a saint, though she was honored locally as a saint. The Church of England considered her a saint. On May 10, 2012, Pope Benedict XVI officially declared her a saint of the Roman Catholic Church, and named her as a Doctor of the Church (meaning her teachings are recommended doctrine) on October 7, 2012. She was the fourth woman to be so honored, after Teresa of Avila, Catherine of Siena and Térèse of Lisieux. Legacy of Hildegard of Bingen. Hildegard of Bingen was, by modern standards, not as revolutionary as she might have been considered in her time. She preached the superiority of order over change, and the church reforms she pushed for included the superiority of ecclesiastical power over secular power, of popes over kings. She opposed the Cathar heresy in France, and had a long-running rivalry (expressed in letters) with another whose influence was unusual for a woman, Elisabeth of Shonau. Hildegard of Bingen is probably more properly classified as a prophetic visionary rather than a mystic, as revealing knowledge from God was more her priority than her own personal experience or union with God. Her apocalyptic visions of the consequences of acts and practices, her lack of concern for herself, and her sense that she was the instrument of God's word to others, differentiate her from many of the (female and male) mystics near her time.